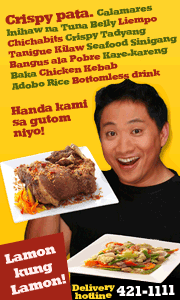 An online delivery directory of Philippine Fast Food and other Restaurants in Metro Manila. Before Jollibee, before McDonald's, before Burger King, before anyone else, it seems, there is Tropical Hut Hamburger. And hamburger it is, indeed the best it could ever be. But that was long ago. Now, Tropical is just a vestige of its former self. Everyone suspects that their hamburger is where Jollibee's came from - They almost have the same taste. Their fried chicken is also just like Jollibee's, but this time it was Tropical who copied it. Tropical has other food selections, like Bistek (a local version of beef steak er strips) and other sandwiches. However, the place is not world class. It is not as clean nor as well kempt as McDonald's or Jollibee. And they have a very poor image. Although food is good, you wouldn't want to be seen there. Food: Hamburger, spaghetti, Fried Chicken, Local breakfasts, Salads, sandwiches, etc. 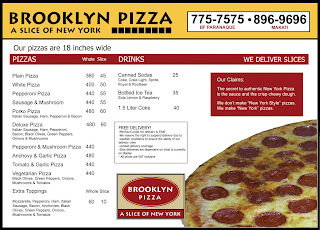 Another new entrant serving the Pizza market is Brooklyn Pizza. Their coverage is quite limited though - only in Makati and Paranaque areas as of this time. We have ordered from Brooklyn twice and it took them long to deliver in both occassions. Their pizzas are nice though, but the question is: Is it worth the wait? This fast food restaurant started big in the 90s, but seems to have encountered a decline in 2000s. Now it is somewhat reborn and posturing to the "healthy" segment of the market. 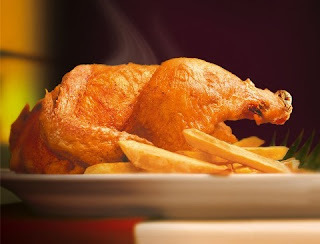 The restaurant features Chicken cooked in a wood-fired rotisserie. It seems though that the rotisserie is just for display as I see them get their cooked chicken from an ordinary oven. Wood fired or not, I still love their chicken. Anyway, they also have nice side dishes. My favorite are the corn/carrots and pasta with cheese. I also like the garlic mushrooms. I have not bothered ordering the other food in their menu though, such as ribs and sandwiches. A modern Filipino restaurant, offering local fares with a twist. A little slow on the service, but food is good. I like their Kare-kareng Gulay and the Crispy Pata. It is here that I first tasted and liked Crispy Kangkong. 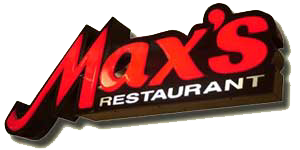 Nothing beats Max's for Crispy Fried Chicken. Their Pancit Canton (a Filipino adaptation of a Chinese Noodle dish) is also tops as well as their Hototay Soup (some sort of egg, pork and vegetable soup). Their other local fares are also the best (too many to mention here). This restaurant is perfect, for Filipinos and even for foreigners visiting the country and who would want to taste the local food. They have the best Crispy Fried Chicken in all of the Universe (see below, click for bigger image)! They have a single number for delivery and you can order online too. Perfect. When it comes to delivery, nothing should beat Domino's who made "delivery" its main business. I wonder why they do not have a single number to call for delivery, though. And I am not sure why they do not have a local website or a way to order for delivery online. Their Pizza is OK, and I like their Buffalo wings. Red Ribbon is a nice bakeshop that offer premium cakes as well as rice meals and other snacks. I especially like their Mango Cake. I also love their Palabok (a local noodle dish that looks similar to but tastes very far from spaghetti!). Red Ribbon also introduced chocolate mousse to the Filipino taste and is best known for that.